This deluxe limited edition comes with an embossed slipcase specially designed to look like the iconic Super Mario ? Block! Inside, you ll find one of four covers--Super Mushroom, Fire Flower, Super Star, or 1-Up Mushroom--each accentuated with shimmering holofoil! The book also includes a ribbon bookmark, decorated with a pattern of Super Stars! Super Mario Bros. Encyclopedia: The Official Guide to the First 30 Years is jam-packed with content from all seventeen Super Mario games--from the original Super Mario Bros. to Super Mario 3D World. Track the evolution of the Goomba, witness the introduction of Yoshi, and relive your favorite levels. This tome also contains an interview with producer Takashi Tezuka, tips to help you find every coin, star, sun, and mushroom--even explanations of glitches! With information on enemies, items, obstacles, and worlds from over thirty years of Mario, Super Mario Bros. Encyclopedia is the definitive resource for everything Super Mario! 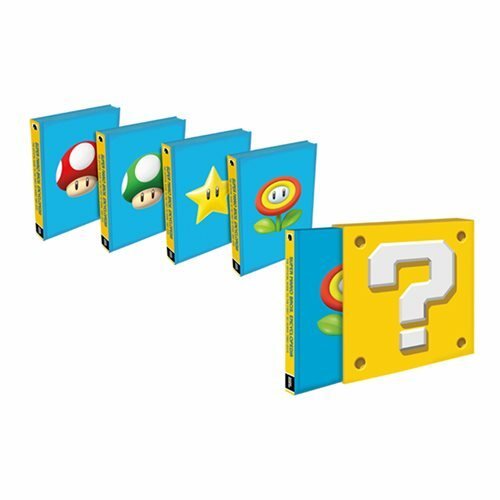 Buyers will receive one of four covers, chosen randomly (Super Mushroom, Fire Flower, Super Star, or 1-Up Mushroom), each in the ''Question Mark Block'' slipcase. 256 pages.